Bessie Harvey, Five Sorcerers, 1986. Clay. I’ve spent about a quarter of a century studying and writing about the work of self-taught artists, especially focusing on the work of African American artists. So I was pleasantly surprised to find two examples of the work of Bessie Harvey on a recent visit to the Knoxville Museum of Art. All too frequently, self-taught artists like Harvey are excluded from such exhibitions as “Higher Ground: A Century of the Visual Arts in East Tennessee”; their work tends to be segregated in shows specifically dealing with the self-taught genre. I applaud the KMA for including this important self-taught artist among her academically trained peers in celebrating the region’s rich artistic tradition. Bessie Harvey (1929—1994) is considered among the top tier of 20th century American self-taught artists; her work has been shown in virtually every major exhibition of “folk” art in the past 25 or so years, is included in numerous museum collections, and in 1995 was selected for the prestigious Whitney Biennial. Harvey, born in Dallas, Georgia, moved to Knoxville, Tennessee in the late 1940s, and then to nearby Alcoa, known chiefly for its aluminum smelting plant, where she created her entire artistic output. There was little in Harvey’s early life to indicate any likelihood of future success. Born into abject poverty, she was the 7th of 13 children, her father died when she was a child, and her mother was an alcoholic. She later recalled, “There was nothing. In the morning, you’d just get up, go looking for whatever you could find, and if you had one meal that day, then you’d made progress.” Harvey’s formal education ended in the fourth grade, and she worked as a domestic in private homes for many years. She first married at the age of 14, and endured years of domestic violence. By the time she was 35, she was the mother of 11 children, struggling to survive with little but her religious faith to see her through. Harvey was deeply spiritual and loved nature. Based on visions that she believed were inspired by God, she began creating sculptures in 1972. She first displayed her art at the Blount County Memorial Hospital, where she was a member of the housekeeping staff, in 1977. Although she also worked in clay, Harvey is best known for her mixed media sculptures in which she combined embellished found natural forms with manmade objects. 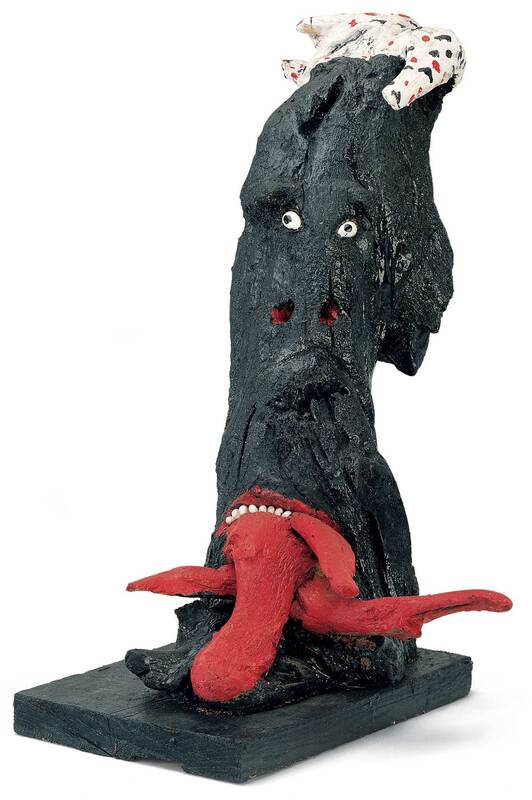 Bessie Harvey, The Poison of the Lying Tongues, 1987. Found wood, cowrie shells, paint. 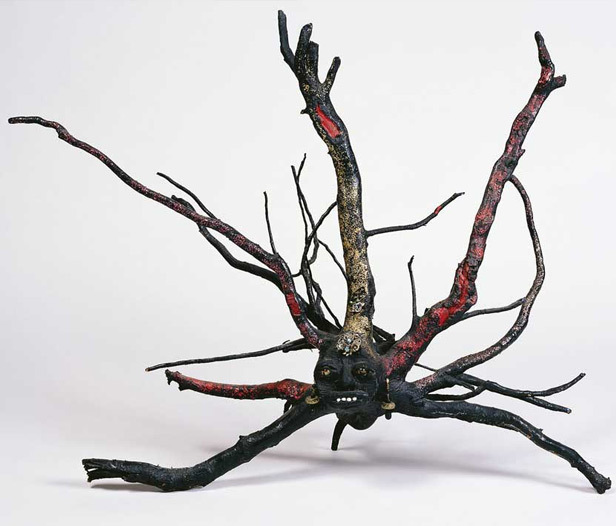 Harvey’s work belongs to a widespread African American visionary tradition that has been described as a unique “collaboration between the artist, God, and nature.” The ability to see anthropomorphic forms in roots, limbs, and driftwood—materials held sacred by African artists for their great spiritual powers—is not uncommon among African American visionary artists, and points to the survival of cultural Africanisms on this side of the Atlantic. Harvey is one of many African American artists who echo the belief that their role is to give physical form to spiritual presences already inherent within the materials. The artist’s role is to “bring out” these presences, usually by adding elements that might include shells, hair, cloth, paint, and other found or improvised items. The resulting forms are raw, powerful, and charged with energy. Bessie Harvey, Faces of Africa II, 1994. Painted wood, wood putty, glitter and found objects. 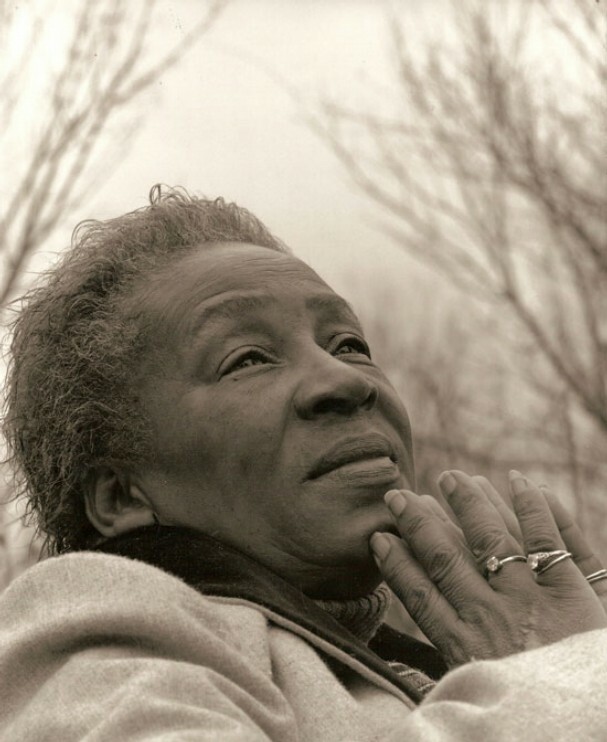 Celebrated by her community and lauded by her state as one of its leading artists, Harvey received the Governor’s Award, Tennessee’s highest artistic honor, in the year of her death, 1994; the street in Alcoa where she lived has been renamed Bessie Harvey Avenue. Like many of her fellow self-taught artists, Bessie Harvey’s compelling story is one of perseverance and personal triumph against all odds, in which an artistic individual is inspired to create objects of great beauty and power amidst the most formidable circumstances.